^ Rachel Dickinson (2009). Falconer on the Edge: A Man, His Birds, and the Vanishing Landscape of the American West. Houghton Mifflin Harcourt. p. 21. ISBN 9780547523835. https://books.google.co.jp/books?id=AMs84ZgX_cIC&pg=PT42. Soma, Takuya (2012a). 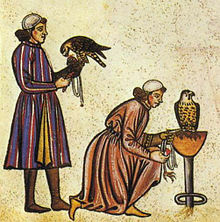 “Ethnoarhchaeology of Horse-Riding Falconry”. Asian Conference on the Social Sciences official conference proceedings (International Academic Forum): 167-182. ISSN 2186-2303. http://iafor.org/archives/offprints/acss2012-offprints/ACSS2012_0271.pdf. 相馬, 拓也 (2012). “Contemporary Falconry in Altai-Kazakh in Western Mongolia”. The International Journal of Intangible Heritage 7: 103-111. http://www.ijih.org/fileDown.down?filePath=7/dtl/49d2b3ba-6ffc-4010-9135-49548a52586f&fileName=%EA%B5%AD%EC%A0%9C%EC%A0%80%EB%84%90%20%EC%98%81%EB%AC%B87%ED%98%B8%20(Takuya%20soma).pdf&contentType=volumeDtl&downFileId=419. Soma, Takuya (2012b). “Intangible Cultural Heritage of Arts and Knowledge for Coexisting with Golden Eagles: Ethnographic Studies in “Horseback Eagle-Hunting” of Altai-Kazakh Falconers”. The International Congress of Humanities and Social Sciences Research: 307-316. http://www.analytrics.org/Documents/HSS_Actes_Proceedings_2012.pdf.